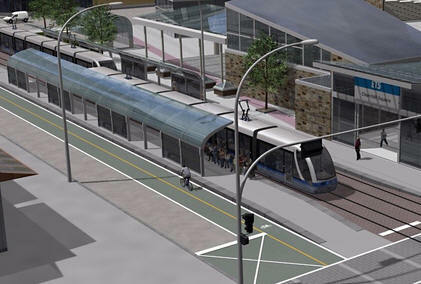 Myrtle Macdonald speaks with 2013 election NDP candidate Patti MacAhonic about light rail for the Fraser Valley. ere in the Chilliwack-Abbotsford communities the Mennonite, Dutch Reformed and Alliance Church farmers vote traditionally for Conservative -Liberals. What are you doing to win their votes? Door to door? Please consider how deprived rural people are, especially small family farmers and their teens. They could have passenger service on the Southern Railway route via Yarrow and Greendale to market their vegetables and fruit. They can’t make a living without second jobs. The youth who love farming have to change careers for an income. 4H, sports and youth agricultural fairs have died out. You are letting hard, tasteless strawberries, nectarines and vegetables sell for much less in supermarkets, while locally grown rot in the fields with very few purchasers and no marketing policies. Many give up and grow corn, tree farms and shrubs and become gentleman farmers who commute to work. Chilliwack at one time was Cherry Capital of BC. Peaches, apricots and kiwi can and have thrived here. Traffic by massive trucks greatly increased the costs of road maintenance and widening. The polluted air greatly increases all incidence of all chronic diseases plus health care costs. It is funneled up the Fraser Valley leaving the air much cleaner in metro Vancouver, Bellingham, Tacoma and Seattle. Therefore they are unaware of our suffering. In all the mountain valleys in central BC, there could be terraced fields growing fruit, vegetables, soya and other legumes. With government support, schools, rural health care professionals and infrastructure, many thousands of unemployed and underemployed people could find work and success.